In seeking re-election in 1916, Woodrow Wilson had the advantage of incumbency, but lacked the benefit of the split among the Republicans which had largely secured election to his first term in 1912. Wilson also had his own problems in uniting Democrats behind his re-election campaign. He had built an impressive progressive domestic record, but his advocacy of continued American neutrality in the war in Western Europe while also calling for added spending for military preparedness had troubled those seeking a clearer direction on his war policy. In 1915, the sinking by German submarines of the British passenger liners Lusitania and Arabic resulted in the deaths of 131 U.S. citizens, provoking calls for American entry into the war and criticism of the President's failure to act. German Americans, anti-British Irish Americans and other national and ethnic constituencies with strong interests in the outcome of the European conflict pressed for policies favoring their sides in the war. At the Democratic convention in St. Louis, Wilson was nominated on the first ballot, as was his running mate, Vice President Marshall. The platform called for military preparedness, a world association of nations to maintain peace after the war in Europe had ended, Pan-American unity, a ban on child labor, women's suffrage, and prison reform. During the convention, the delegates cheered a new campaign slogan, "He Kept Us Out of War," which world conditions made a hope more than a promise. Among the Republicans, Theodore Roosevelt made another attempt to secure the nomination, aggressively calling for intervention on the side of Great Britain and accusing Wilson of cowardice for his mediation efforts. But Roosevelt's campaign failed, largely due to the resentment many Republicans felt toward him for splitting the party in 1912, which they believed had handed the election to Wilson. Roosevelt also alienated many families of immigrant stock by charges such as "Those hyphenated Americans who terrorize American politicians by threats of the foreign vote are engaged in treason to the American Republic." The Republicans nominated Charles Evans Hughes of New York, a moderate Republican whom Taft had appointed to the Supreme Court in 1910. Roosevelt derided Hughes as "a bearded iceberg," but Hughes won the nomination on the third ballot with 949 votes. Former Vice President Charles W. Fairbanks of Indiana was picked for the second spot on the ticket. In the November election, Wilson won narrowly with 49.4 percent of the popular vote to 46.2 percent for Hughes and a 23-vote margin in the Electoral College with 277 to 254 votes for Hughes. Wilson's victory was aided by his wins in a few key midwestern states with large numbers of German Americans who opposed the U.S. entering the war against Germany. In the months after the election, however, Wilson's policy of neutrality was increasingly undercut by German provocations. During a meeting in January 1917 of German military and government officials, the German Navy convinced the leadership and Kaiser Wilhelm II that a resumption of unrestricted submarine warfare could help defeat Great Britain within five months. German policymakers argued that they could violate their pledge not to attack neutral shipping since the United States could no longer be considered a neutral party after supplying munitions and financial assistance to the Allies as well as acquiescing to the Allied blockade of Germany. On February 1, Germany announced that it was resuming its submarine attacks on shipping which earlier in the war had sunk or damaged American ships. Wilson responded by severing diplomatic relations with Germany, but held off on asking Congress for a declaration of war. At the end of the month, Wilson released the text of a telegram intercepted by the British sent by German Foreign Minister Arthur Zimmerman to the German ambassador in Mexico. The message proposed that, in the event of American entry into the war, the ambassador suggest that Mexico join as an ally of Germany against the U.S. with the promise of possibly regaining its former territory in New Mexico, Texas, Arizona, and California which it had lost in the Mexican War of 1848. ....We are of the blood of all the nations that are at war. The currents of our thoughts as well as the currents of our trade run quick at all seasons back and forth between us and them. The war inevitably set its mark from the first alike upon our minds, our industries, our commerce, our politics and our social action. To be indifferent to it, or independent of it, was out of the question. A month later, on April 4, 1917, Wilson asked for and received from the Congress a declaration of war against Germany. In his message, he asked that Congress "...declare the recent course of the Imperial German Government to be in fact nothing less than war against the Government and people of the United States; that it formally accept the status of belligerent which has thus been thrust upon it, and that it take immediate steps not only to put the country in a more thorough state of defense but also to exert all its power and employ all its resources to bring the Government of the German Empire to terms and end the war." Wilson emphasized that the main goal of the war should be make the world "safe for Democracy" by ending militarism and creating an international peace organization to avoid future wars. In the next month, Congress passed the Selective Service Act, the first draft since the Civil War, and by the end of the war 2.8 million men were in the military. Some 13,000 women volunteers also joined the effort, primarily serving in clerical and other support roles in the Navy and Marines. To quiet domestic dissent and guard against spying, the Congress also passed at Wilson's request the Espionage and Sedition Acts prohibiting interference with the draft and criticism of the government, the armed forces, or the war effort. One of the 1,500 arrested for violating the laws was Eugene V. Debs, leader of the Socialist Party, who served nearly five years of a ten-year prison sentence until his sentence was commuted by President Harding in 1921. The Post Office also was authorized to censor the mail, and over 400 periodicals had their mailing privileges suspended at some point. The Supreme Court upheld the Espionage Act as constitutional in its much-criticized decision in Schenck v. United States in 1919. In 1918, American soldiers under the command of General John J. Pershing helped repulse the German advance towards Paris during the Second Battle of the Marne in June; in September, when their numbers had grown to over 500,000 troops, the US forces attacked the Germans in the Battle of Saint-Mihiel. In the Meuse-Argonne offensive, Pershing commanded more than one million American and French soldiers in an action which resulted in heavy German losses that pressured Germany to seek an end to the fighting. On November 11, 1918, the Germans and the allies agreed to sign an Armistice which suspended all combat. With the end of the war, Wilson hoped to shape the negotiations to establish a lasting peace. In his "Fourteen Points" speech delivered to Congress in January 1918, he had called for a "new diplomacy" consisting of "open covenants openly arrived at" without the secret treaties which had drawn so many nations into the recent war. Wilson also proposed ending the colonial holdings of the Europeans, an idea not welcomed by allies like Britain and France. In December 1918, he became the first president to travel to Europe while in office, spending most of the next months in Paris negotiating the terms of the Versailles Treaty until agreement was reached in June 1919. The treaty also incorporated Wilson's proposal for the creation of a League of Nations, which along with his earlier peace-making efforts led to his being awarded the Nobel Peace Prize. On his return to the U.S., Wilson faced strong opposition in the Senate to the treaty's terms, particularly to its creation of the League of Nations, and he launched an extensive speaking campaign in the Western states to build public support for the treaty's ratification. While on the trip, Wilson had a series of minor strokes; after delivering a speech in Pueblo, Colorado, his doctor ordered that he cut short his trip on September 26, 1919. Upon his return to Washington, he suffered a severe stroke on October 2 that left him partially paralyzed on his left side. 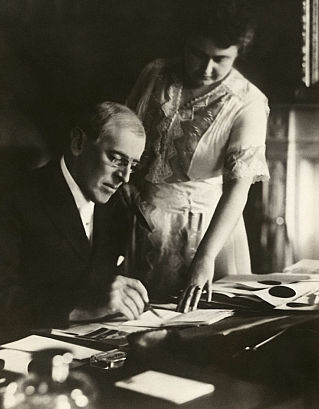 He became an invalid in the White House, with access and news on his condition closely guarded by his wife Edith, who conveyed his opposition to final efforts by the treaty's supporters to reach a compromise to secure the necessary two-thirds Senate majority for ratification. Many treaty opponents argued that the League would constrain the power of the Congress to declare war, but potential compromises sent to the White House were rejected, with Mrs. Wilson conveying the President's opposition to final efforts by the treaty's supporters to secure the necessary two-thirds Senate majority for ratification. In two separate votes in November 1919 and March 1920, the treaty failed of ratification. During the rest of his second term, the status of Wilson's health continued to be covered up by Mrs. Wilson, who communicated decisions to outsiders which purportedly had been made by him, and by his doctors, who released deceptively optimistic reports. The official White House explanation was that Wilson was suffering from "nervous exhaustion." He gradually recovered from the more severe effects of the stroke, using a wheelchair and cane for a period, but rarely made public appearances and never again fully regained his health. During his first term, Wilson had been criticized for his lack of support for an amendment to the Constitution granting women the right to vote. He had given tacit support to efforts in the states to grant the franchise in their own constitutions, but had resisted the attempts to enact suffrage on a national basis, which was opposed by several southern states on the ground that it would interfere with states' rights. After the nation entered the war in his second term, however, Wilson came out forcefully for a federal amendment, asking in a speech to Congress, “We have made partners of the women in this war… Shall we admit them only to a partnership of suffering and sacrifice and toil and not to a partnership of privilege and right?” On June 4, 1919, what would become the 19th amendment finally received the votes necessary in the House to be sent to the states for ratification by 36 legislatures; it became effective following Tennessee's approval on August 18, 1920. Wilson left office on March 4, 1921, riding to the Capitol with his successor, the Republican Warren G. Harding, who had campaigned aggressively against Wilson's policies. Harding's campaign slogan "A Return to Normalcy" reflected a public sentiment to refocus on domestic concerns after Wilson's ventures into international affairs; "Tranquility at home," Harding stated, "is more precious than peace abroad.” Wilson retired with his wife to a home they had purchased in Washington, and was rarely seen in public, but did make a brief radio address on Armistice Day in 1923, later dying at his home on February 3, 1924.